Jordana Mishory comes to WIT following nearly a dozen years as an award-winning journalist in Washington, D.C. and South Florida. Prior to starting as WIT’s operations manager, Jordana spent seven years reporting on acquisition, auditing, and IT reform at the Defense Department with Inside the Pentagon. And while at the Daily Business Review in Fort Lauderdale, Fla., Jordana covered a $1.2 billion Ponzi scheme and exposed judicial wrongdoing. Her stories led to the institution of more diversity training for judges and were the first to probe how Florida’s secretive judicial watchdog agency operated behind closed doors. A graduate of Northwestern University, Jordana has served on the District Improv Board since 2014, overseeing the selection committee and helping to organize the annual festival. A long-time WIT teacher and coach, Jordana performs with House Ensemble Love Onion and with the 2016 production of POTUS Among Us. Jordana has also performed with indie teams Cake Bagel, Sweater Kittens and Jos. A. Banksy, among others. She helped plan Improvapalooza for four years and firmly believes it should be a national holiday. 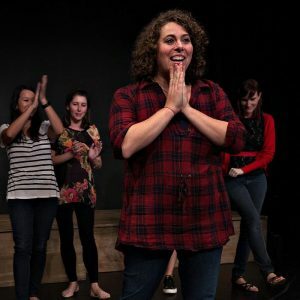 When Jordana Mishory met improv, it was love at first sight. Like, eyes-bulging, tiny-hearts-floating-around-your-head, ready-to-commit-for-life love at first sight. Nearly seven years later, the attraction is still going strong. During the day, Jordana works as WIT’s operations manager. At night, Jordana teaches Harold and Ensemble classes at WIT and performs with House Ensemble Love Onion. She also plays with subversive artists Jos. A. Banksy, science-minded improvisers in The Hypothesis, and all-female super group Sweater Kittens. She was a cast member of WIT’s POTUS Among Us 2016 and previously played with long-time indie stalwarts Cake Bagel. She has performed at festivals across the country including the Del Close Marathon and the Chicago Improv Festival. Jordana completed the WIT curriculum and trained at the Upright Citizens Brigade Theatre in New York. She has spent enough money on workshops over the years to presumably purchase her own private island. (She assumes, having no idea how much private islands cost). Jordana cooks, cleans, and fishes more in scenes than she does in real life. Despite loving to make things up, she couldn’t come up with a better name for her cat than Namey. During the day, Jordana works as WIT’s operations manager. At night, Jordana teaches Harold and Ensemble classes at WIT and performs with House Ensemble Love Onion. She also plays with subversive artists Jos. A. Banksy, science-minded improvisers in The Hypothesis, and all-female super group Sweater Kittens. She was a cast member of WIT’s POTUS Among Us 2016 and previously played with long-time indie stalwarts Cake Bagel. In her free time, Jordana chairs the District Improv Board and directs WIT project Hellcat. Jordana is a strong advocate of side-coaching with an intense focus on believable emotions and strong deals. She is a stronger advocate of having the most fun you’ve ever had in your entire life while on stage. She spends most of her time in scenes trying not to giggle at her hilarious troupemates. The Assisted Breath, as made popular in the final dance battle in "Step Up 2: The Streets" and season four of "So You Think You Can Dance"